A couple of weeks ago I went to Montreal for work. I was the second time for me and this time around, we had two Saturdays to explore the city, and plenty of evenings to try some of Montreal's best restaurants. Although it was absolutely freezing during our trip, we powered through and did as much exploring as we could. 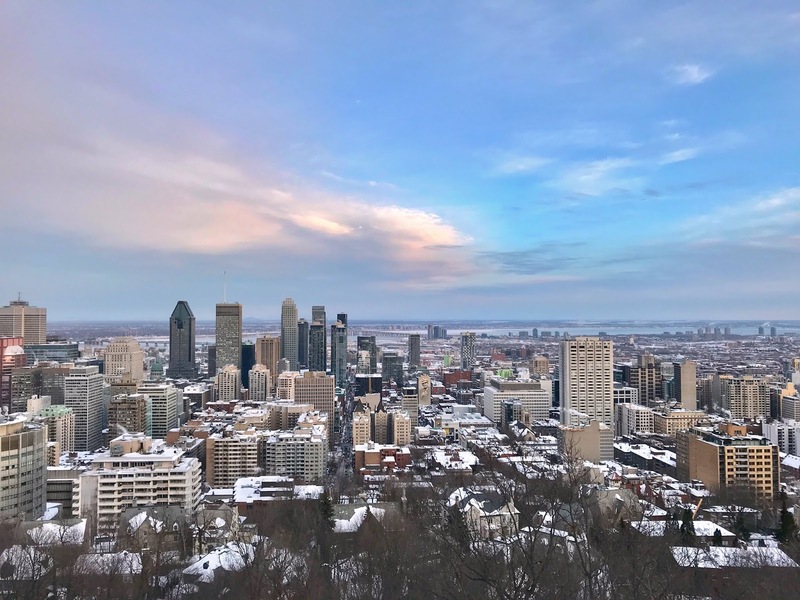 So here's my little city guide of Montreal, hope you like it. Although we only had a week in Montreal (and a 40+ hour work week), we managed to tick off quite a few restaurants off our list! Montreal's food scene is really good, with many different cuisines like Italian, Vietnamese, Japanese, Canadian, Mexican.. you name it! Pikolo: This is supposedly one of the best coffee places in Montreal, so this is where we spent our first morning. The coffee is really great, the staff and service not so much. Bar a beurre: This is a very cute little lunch/pasty spot. I had a delicious artichoke sandwich here, but they're also specialised in homemade baked goods! Good for a quick stop. Origine: This is a nice student café in the neighborhood of McGill University. The coffee here was at least as good as Pikolo and the service 10 times better. They also do good matcha! Le Cartet: Brunch places are crazy packed here, and so is Le Cartet. It's kind of a deli-restaurant hybrid. I must say I wasn't blown away by this place in terms of food, but I did like the deli! Chez Mere Grand: This is the kind of friendly neighborhood café you keep coming back to. The guys who work here are super kind and they make some great food. I loved the salads and soups especially! Mandy's: This is kind of the Canadian version of Sweetgreen. The menu consists of a bunch of different salads, all quite different! I tried two salads here, and the superfood salad was my favorite. Arthurs Nosh Bar: This must be one of Montreal's most popular brunch spots because even at 9 am we had to put our names down on the waiting list. But the wait was worth it! This Jewish deli serves up some seriously delicious food. The pancakes were actually some of the best I've ever tried (up there with Five leaves and Granger & Co - don't look if you're hungry). Vua: Some of our colleagues took us to this little Vietnamese sandwich (Banh Mi) place for lunch. The food is insanely cheap here, I think my vegetarian sandwich was less than 5 Canadian dollars, which is €3.30. It was delicious too! Le Red Tiger: Another Vietnamese place on this list! We randomly discovered this one and came here for dinner one night. The food is fresh and good, but the drinks are what really stands out at this place. We also LOVED the banana dessert (ok and the cute waiter). Magpie: This pizza place is where we ended up on our first night in Montreal. The fresh pizza from Magpie was all we needed to send us straight into a happy snooze. Didn't love the tomato sauce, but the dough and buffalo mozarella was really good! Moleskine: Our return flight had a long delay, so to pass the time we had our final dinner at Moleskine. I'd already been here last June, and the pizza was as good as I rememembered. There's actually a shocking amount of great pizza places in Montreal so I'll need to expand my pizza-horizon next time! Épicerie Pumpui: I would have never discovered this little Thai deli, if it weren't for my boss. It's one of her favorite spots and I totally understand why. The place is very no-nonsense and so is the food! Super tasty, super spicy dishes. The red curry and pad thai were my favorite. Ichigo Ichie: This place is half-ramen bar half-Izakaya. If you don't book, you'll wait for a spot in the ramen bar. If you book, you'll be seated in the Izakaya section. We did the latter and it didn't disappoint. All the dishes we tried were scrumptious, but the best was the black cod (which I'll happily make an exception for, even as a vegetarian). Grumman 78: This place gave me real Tacombi vibes (that Mexican place in New York!) I rarely eat Mexican so coming here was a real treat. I must say that the starters were more to my taste than the actual taco's. Try the queso fundido and the aubergine dish. Venice: We came here for an early dinner one night, before a hockey game. The colourful, bright interior immediately gives off summer vibes, as well as the menu. Although I wasn't blown away by the food I can imagine this being a really cosy spot during summer, outside on the terrace! Bar Loïc: This is a wine bar/restaurant located in a cool corner building in Saint-Henri. I only tried the drinks here but the food is supposed to be delicious! This looks like the perfect date-night spot. Bar de Courcelle: Montreal is known for it dive bars, and this is one of those (although slightly more hipster than your average dive bar). They seem to do many live music nights (even open mic!) which could fun. Bar Pamplemousse: I think I discovered my favorite bar in Montreal. I love the name, the adorable illustrated menu's, the special wines and beers, the food (the naan!)... and they have a discoball, to top it all off. Everything is just right at this place! Mont Royal: This is a small mountain/hill in the middle of the city. The name Montreal also comes from this mountain (no surprise here). You can either drive up or walk up here, and enjoy the views over the city. In the winter it's kind of a winter wonderland, with plenty of ice skating and luging opportunities. HABS Hockey Game (Centre Bell): Ice hockey is the national pride of Canada, so watching a game was high on our to-do list. We watched a game between the HABS (Montreal Canadiens) and the team from Philly. The HABS won big-time which made it a lot of fun to watch. The atmosphere in the station was also really different than at any other sport I've watched. Tickets are not cheap but it's definitely worth it. Montreal Museum of Fine Arts: According to the internet this is one of the best museums in Montreal, and it really didn't disappoint. We saw an incredible Calder exhibition here but also the permanent collection is also great, with both Canadian and European art from all periods. Shopping: Of course Montreal also offers some good shopping, and if you're a fan of Lululemon like me, it's heaven. Canadian brands (like Lulu and Aritzia) are considerably cheaper than in Europe. Rue Saint-Catherine essentially has all the shops you want! 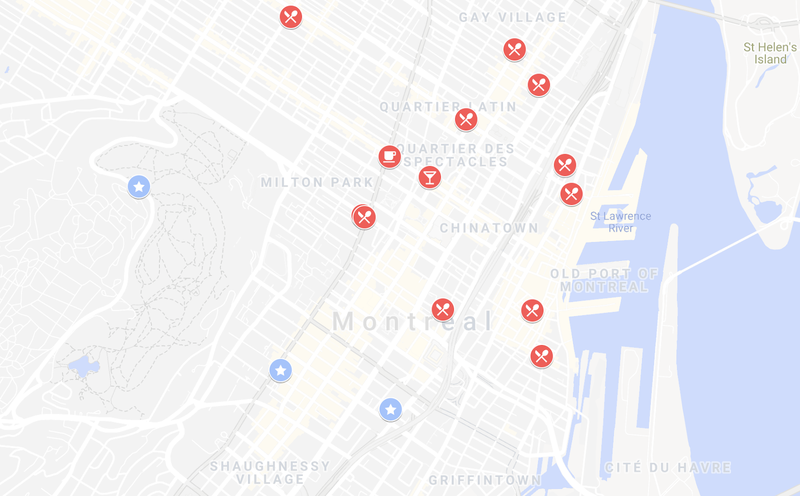 Click on the map below to go to my Google Maps guide of Montreal. That was it for my Montreal mini-guide! We also went to Costco one day which is a cray experience if you've never been (random but fun). This was only my second time in Montreal but I feel like there's a lot more to explore! I'll be going back in June so I'll get back with a part 2 of this guide.